Well we are back from our camping adventure and thankfully this year the rain waited until we had arrived home. The kids had such a great time, as did the adults. It is so lovely to relax and enjoy each other's company. Now to start planning next year's Easter adventure. 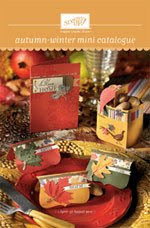 While I was awol the new Autumn/Winter Mini Catalogue has gone live. Click here to check it out. If you would like a copy contact me and I will pop one in the post to you. We have some fantastic new product lines including the Big Shot. I can't wait to get my hands on some of Stampin' Up! 's exclusive dies. If you are as excited as I am about this product you will want to check back Thursday to see my bundle deal for the Big Shot.